Installation view at The Jewish Museum showing the triptych of sister portraits from 1923 by Florine Stettheimer, (left to right): Portrait of Myself, oil on canvas laid on board, 40 3/8 x 26 3/8 in. (102.7 x 67 cm); Portrait of My Sister, Carrie W. Stettheimer, oil on canvas laid on hardboard backing, 37 7/8 x 26 in. (96.2 x 66.2 cm); and Portrait of My Sister, Ettie Stettheimer, oil on canvas laid on hardboard backing, 40 3/8 x 26 1/4 in. (102.2 x 66.8 cm). Art Properties, Avery Architectural & Fine Arts Library, Columbia University in the City of New York, Gift of the Estate of Ettie Stettheimer, 1967. Columbia University is the major lender to the current exhibition Florine Stettheimer: Painting Poetry, which is now open at The Jewish Museum in New York City (May 5-September 24, 2017), and then travels to the Art Gallery of Ontario in Toronto, Canada (October 21, 2017-January 28, 2018). Columbia is the largest repository for the art of American modernist Florine Stettheimer (1871-1944). 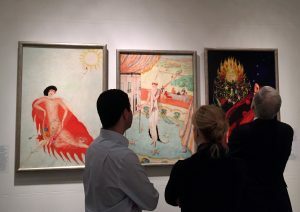 Over 65 paintings, drawings, and decorative arts objects are housed in and stewarded by Art Properties , and the Rare Book and Manuscript Library holds the Florine Stettheimer Papers . Art Properties has fifteen paintings and drawings, and a decorative heart screen, on loan to The Jewish Museum. This entry was posted in Art Properties, Avery on the Road, Exhibitions on May 4, 2017 by Ted.